Financial writer and best-selling author Peter Sander sits down with portfolio manager Axel Merk for insights on investment considerations in light of the risks posed to the greenback. Peter: A lot of talk about a “dollar crash” keeps coming up in the blogosphere. Is it a serious threat, and if so, what should an investor do about it? Axel: A “dollar crash” is what we call a “tail risk” event. It's something that may or may not happen, but would have a large impact if it did happen. “Black Swan” author Nassim Nicholas Taleb calls such events “so rare as to be beyond the normal expectations in the history of finance.” Not everyone thinks the threats to the dollar are so remote, but that’s ultimately up to each investor to assess for himself or herself. My view is that if an investor believes a risk is non-negligible, it may be prudent to take it into account in one’s portfolio allocation; investment professionals may even have a fiduciary duty to do so. Peter: Let's dig a little deeper. 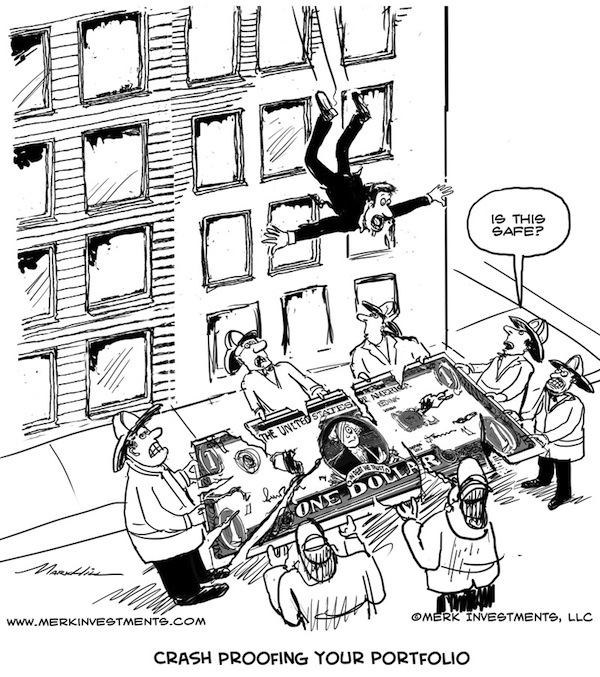 Why are investors concerned about a “dollar crash,” and are those concerns justified? Axel: The “dollar crash” scenario starts with news we’re all familiar with about unsustainable deficits. The current deficit and Congressional gridlock is the short-term story; the real long-term story is entitlements and the future trajectory of the deficit. Without entitlement reform, we may go broke. Of course, that increases the risk of a bond market selloff, particularly if foreigners who buy bonds to finance our budget deficits back away from the Treasury market. And because we have a current account deficit, we need foreigners to buy billions in U.S. dollar denominated assets every single day just to keep the dollar from falling against foreign currencies. Should the bond market turn into a bear market, the dollar might be at risk simply because foreigners stay on the sidelines. As such, we don't need the Chinese or Japanese to actively dump their bonds for the market to react. The massive current account deficit (and corresponding surpluses of other nations) that makes the U.S. dollar vulnerable is part of what are sometimes referred to as global imbalances. The late European Central Bank (ECB) President Wim Duisenberg said back in 2003, he "hopes and prays that the adjustment process will be slow and gradual." The risk of a "disorderly adjustment of global imbalances" has long been central bank code for a potential dollar crash and has made it into dozens of ECB statements over the years. When I heard a decade ago that central bankers revert to hopes and prayers in managing policy, I knew I had to act. In my research at the time, I identified the building credit bubble; subsequently in 2005, I took it a step further and moved my clients out of U.S. real estate and the faltering U.S. dollar by investing in hard currencies and gold; in early 2007 we cautioned that volatility would surge, causing a painful credit contraction affecting all asset classes. What matters is not just considering risks, but taking action when one believes the risks are too significant to ignore. It turns out that a selloff in the bond market could even be triggered by a positive event such as an uptick in economic growth, as economic growth tends to correlate with a selloff in the bond market in anticipation of higher interest rates (bond prices and interest rates are inversely correlated). And note that it doesn’t really matter whether Americans or foreigners sell Treasuries; what matters is that such a selloff might amplify borrowing costs for the government, making it more apparent that deficits might be unsustainable. As history has shown, the market may move surprisingly quickly when re-pricing risk. Axel: Let’s first clarify that even though the dollar rallied in 2008 on the perception of a safe haven, the greenback has been in a long-term decline over the past couple of years, the past decade, the past 40 years. With regard to the Eurozone, most may not be aware that the only major currency the dollar was up against last year was the yen: the U.S. dollar lost almost 2% versus the euro last year. That’s the best the dollar could do when Europe is in crisis! But agreed, if a long-term decline is what some have come to expect, that’s a far fetch from the “crash” some fear. Peter: Can you give a few pointers about tail risk management - more specifically - about what to do in a portfolio? Axel: Generally speaking, to account for tail risk, investors can add a “tail risk bucket” to complement the other asset classes in their portfolio. Keep in mind, though, that most tail risk investments gradually lose money. They lose until and unless the tail event occurs, and investors may have to wait a long time for that to happen. As the saying goes, the markets can stay irrational longer than you can stay solvent. Consider the conventional alternatives. Shorting the markets - especially the Treasury market, can be expensive. If nothing happens, you are the one paying rather than receiving the interest. With long tail events, the challenge is timing. You’ll be wrong every time except for that one perfect storm that may or may not materialize. Meanwhile, you can put up a lot of hard earned cash protecting yourself against that event. It’s what we call an “asymmetric” payoff - almost like a lottery ticket - one very low probability of a very high payoff balanced against many, many loss scenarios. Peter: Okay, so there is no free lunch. But how can investors manage long tail dollar risk? Axel: To start with, one has to acknowledge that there may be no such thing anymore as a risk free asset, as investors may see their purchasing power eroded in a declining dollar environment. Investors may need to take a diversified approach, even to something as mundane as cash. The best way to deal with dollar risk may be to tackle the problem at the source. Gold is one way to hedge against dollar weakness. I hold a substantial portion of my net worth in gold, but for all of us that have their daily living expenses in dollars, keep in mind that the price of gold may at times be rather volatile. It is certainly not risk-free to put all long-tail eggs in one basket. 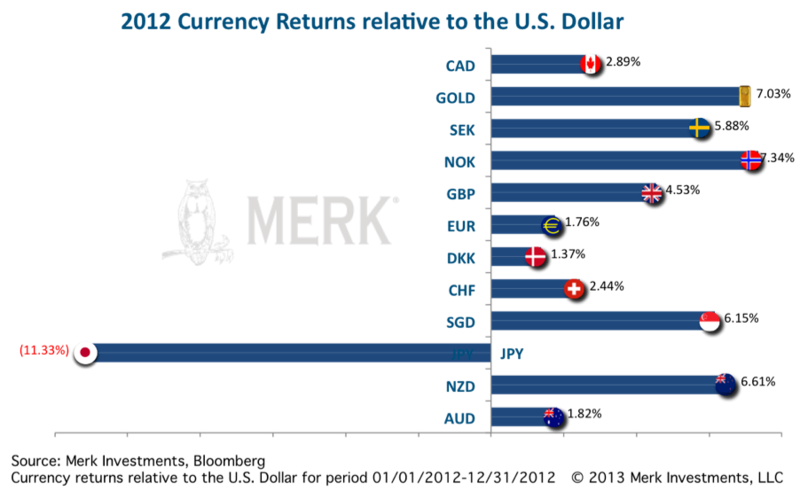 Another approach is to “short” the dollar against a basket of other currencies. First, note that shorting the dollar is different from shorting Treasuries or stocks: one can short the dollar by buying another currency. While one certainly has the currency risk, one can potentially earn interest in that other currency; I say “potentially” as interest rates are rather low in most countries these days. As such, timing becomes less of an issue; and if a gradual, rather than abrupt, dollar decline takes place one might be able to profit even without disaster ever striking. While still with risks - not the least of which being that the dollar can appreciate - it appears to me to be a more direct and less costly way to manage dollar risk than more sophisticated strategies that are assured to be expensive. I’ll note that I referred to a “basket of currencies.” That’s because, just like stocks, a diversified approach to managing dollar risk that includes gold and a basket of currencies may help to provide better risk adjusted returns than merely focusing on gold or a single currency. To illustrate this point, think of the Australian dollar. Many like the currency because of Australia's strong fundamentals, yet the currency has had a rocky ride of late. Or Apple also has strong fundamentals, yet the share price has been under pressure of late; when too many investors are on board with the same view, such stock - or currency - can turn South. Indeed, sometimes there's value when others run for the hills: last August, we published an analysis entitled "Draghi's Genius", finding value in a world of inflated asset prices. While we were right with our call, risk-free it was not. It would not have been prudent to bet one's house on that view. Again, there is no place to hide. There is no risk-free asset. Investing in currencies brings with it similar challenges as investing in stocks. I happen to think that investing in currencies is easier, as there are fewer currencies to watch than stock. I also happen to think that currencies are an ideal place for investors to take a position on what I call the ‘mania of policy makers’. That's because as little as we may like our policy makers here or abroad, the good news is that they may be rather predictable. Peter: One more question - if I set up a long tail bucket, how much should I put into it? Axel: Two key drivers investors may want to consider is a) their own assessment of how likely it is that a scenario they want to hedge or profit from may play out; and b) whether they can bear the risk of the investment. If someone can’t sleep at night with an investment, it’s a clear sign that they own too much of it. A reason why I personally allocate substantial amounts to gold and currencies is because I believe bonds may be in a bubble; and stock valuations may be more driven by the printing presses rather than fundamentals. While it’s nice for investors to see stock holdings go up when more easy money is promised, the challenge is that stocks may no longer be trading based on fundamentals, but only based on the next perceived move of policy makers. Peter: Axel, thanks for the insight. This is one in a series of upcoming interviews with portfolio manager Axel Merk. 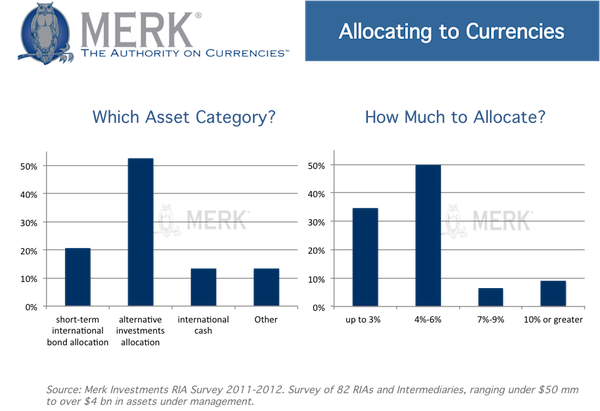 To receive them, register for the free Merk Insights. Separately, Axel Merk will be hosting a webinar on March 21 focusing on managing currency risk in equities; click here to receive more information about our monthly webinars.